Turn It On. Welcome to Luxor, a world of enchantment. DELUXE, 30 story, pyramid hotel that recently underwent a $400 million expansion. A magnificent new lobby with the world's largest atrium. Features Egyptian-themed rooms, King Tut's Tomb and museum, 3-D IMAX attractions and major additions to the spa and shopping concourse. Every one of our luxurious 4,400 rooms and suites is custom designed with king or 2 queen beds. They feature the finest in features and amenities and all have a unique view - be it the strip, the mountains, or our fabulous olympic size pools. Our 10 themed restaurants will satisfy the tastes of the most discerning diners. 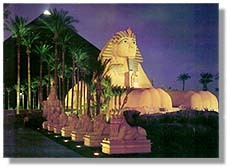 Cocktails and dreams round out the menu at the Luxor with our 24-hour glittering casino, live entertainment/music, three levels of entertainment, and unique shopping arcade. Sit back. Relax. We've got plenty of places to play.